For specific opportunities to serve your neighbors, check out the Learn, Serve, Grow. You can also read about all the ways we are reaching out to our community locally and globally and find out how to get involved. Open to women of all ages for faithful community, lively discussion, and meaningful service. Go to the WELCA website for more information. 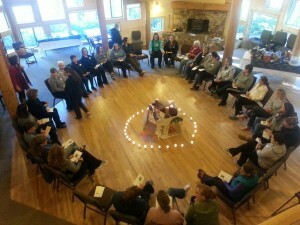 This active group of women at St. Mark’s hosts several activities throughout the year. Our biggest events are a fall retreat, an Advent brunch, and a spring luncheon, all with wonderful programs. This year we started our popular Summer Craft Night series, for crafters of all ages and experience levels to learn and share. We also support the ongoing work of Lutheran World Relief and share our talents with many of the ministries of St. Mark’s. We quilt and assemble school and new-baby kits for those in desperate need at home and abroad, we study the bible, we support youth scholarships, and we work to make St. Mark’s a welcoming place to grow in faith and fellowship. Lydia Circle—first Tuesday of the month in the Parish Commons Classroom—bring a brown bag lunch. Ruth Ann Circle—meets monthly in Gig Harbor homes—contact Suzy Reynolds if interested. Take Them A Meal is a ministry that provides meals to members who are recovering from surgery, undergoing treatment, or facing other life challenges. Using the online tool, “Take Them A Meal”, we coordinate meals that are suited to the recipient’s needs. If you would like to be part of the pool of people who may be called upon to provide meals, please contact Janet Duris.